The jackfruit is a type of tree that is indigenous to India. It produces the world’s largest tree-borne fruit. A jackfruit can way up to 80lb. A fully-grown jackfruit tree can produce 100-200 of these fruits each year. The jackfruit is a multiple fruit comprised of thousands of individual flowers. You eat the petals of the flower. Jackfruit has a unique flavor and aroma. It is being grown in more places across the world as people acquire a taste for it. The fruit itself is very nutritious, and the jackfruit is touted as a possible solution for areas across the world where hunger and malnutrition persist. You can eat it cooked or raw, on its own or incorporated into a recipe. The nutritional value of the jackfruit has led to its reputation as a cancer preventer. It contains many vitamins and minerals. However, a lot of the research in this regard is not yet complete. There is still a long way to go. Nevertheless, the health benefits of eating jackfruit are clear. In addition to being rich in vitamins and minerals, the jackfruit is also rich in phytonutrients or phytochemicals. The plant develops these to help it stave off attacks from germs, fungi, and pests. Phytonutrients are also useful to humans. They are not essential for keeping one alive in the same way as vitamins and minerals but consuming them ensures that the body works properly and some diseases (including cancer) may be prevented. There are 25000 different types of phytonutrients in plants. 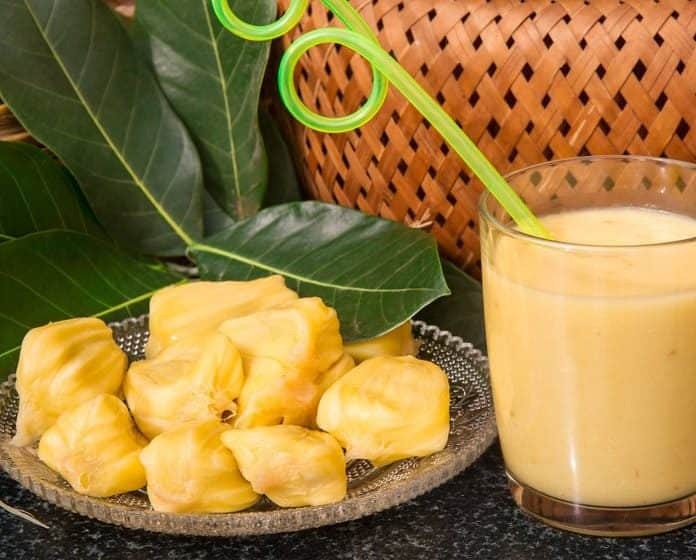 Here are some of the vitamins, minerals, and phytonutrients found in the jackfruit that lead scientists and researchers to believe that it can lower the risk of cancer. It boosts the immune system. Increased intake of Beta-carotene helps the body fight off the free radicals thought to cause cancer. It can act as an antioxidant. The antioxidants introduced into the body by the intake of Beta-carotene can actually destroy free radicals. The body produces free radicals as it makes energy. They are a by-product of the energy production process. These free radicals have a single electron, unlike other molecules which have a pair of electrons. Free radicals look to attach themselves to and destroy any cell they come into contact with in order to pair with another electron. In the destruction of these cells, the body is weakened and more susceptible to illnesses such as cancer. It can convert to Vitamin A in the body, which is a known cancer-fighter. However, overdosing on Vitamin A can be dangerous. It is better to consume more Beta-carotene as this allows the body to convert enough of it to satisfy its Vitamin A needs. Excess Beta-carotene is not dangerous to the body. Several studies have linked regular intake of Beta-carotene to reduced risk of cancer. It is particularly effective in protecting epithelial cells in areas such as the lungs, colon, intestines, bladder, and throat. This means that Beta-carotene can play a significant part in the prevention of cancers of these body areas. Experts recommend that you ingest Beta-carotene naturally instead of by means of synthetic supplements. They believe that supplements are less effective than natural Beta-carotene.